All photos on FairMail cards are taken by Peruvian, Indian and Moroccan teenagers. The youth FairMail selects lives in relatively poor circumstances. At the moment we work with 50 teenagers from Northern Peru, Northeastern India and West Morocco. Their ages comply with the WFTO´s fairtrade criteria regarding child labour and are checked by FairMail. Click on their portraits to learn more about them. 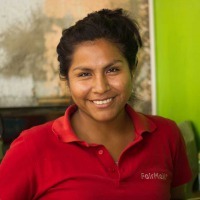 These are the Peruvian FairMail photographers. They live in different parts of Trujillo, a big city on the Northern coast of Peru. A part of them live in Mundo de Ninos, a boy´s home for street children in Huanchaquito. Others live in one of the poorest parts of Trujillo where their families earn money by recycling garbage at the city garbage dump. FairMail Peru also cooperates with the CEP education project in Ramon Castilla to recrute motivated and responsible teenagers. These are the Indian FairMail photographers. They live in the Nagwa slum in the city of Varanasi in Northern India. In this part of the city many people from the lowest castes live who have less opportunities to get ahead in life. FairMail India cooperates with the local Asha Deep and Dunya Education schools to recrute motivated and responsible teenagers. As of the 1st of October 2014 FairMail India stopped the photography trainings. Click here for more information. From 1st January 2019, FairMail stopped selling pictures taken by the Indian photographers. The still existing stock of Indian cards - for which the photographers have already received their fair share of money - will continue to be sold until the cards are sold out. Our contact person in India is still providing guidance to those photographers who have money left in their funds to make sure that it is invested in a way that favors their personal development. The Moroccan FairMail teenagers all live in the coastal city of Essaouira. They participate in the activities of three local organizations that work with at-risk teenagers. These organizations are "Bayti", "Dar Attalib" and "Au Coeur de l'Amitie" and they recommended us the teenagers due to their motivation for school and responsible behavior. In October 2012 FairMail Morocco started with a 2 month trial project in Essaouira. We are currently waiting for the sales of FairMail to increase more so that we can offer these kids a long term participation in FairMail just like the kids in Peru. Read more here. You can vote for new photos and the photo with most votes will become a FairMail card.